Do you know how fast dolphin grow? If those shorts were just a few inches under 20, in another week or so they could have been legally long enough. I found itty-bitty, teeny-weeny ones without getting busted. Less than an inch long, they were swimming in a tank at a laboratory alongside the National Marine Fisheries Service on Virginia Key off Miami. John Stieglitz, a marine biologist from the University of Miami’s Rosenstiel School of Marine and Atmospheric Science across the causeway, dipped a few into a plastic pitcher. They were as transparent as the water. The lab is full of tanks containing mahi-mahi at every stage of development, from egg to adult. Stieglitz and his researchers catch brood stock on hook and line, bring them ashore in transport tanks and transfer them to lab tanks, where they are fed and grown. “They’ve been in captivity about a month now,” Stieglitz says, stopping at a tank.” They were schoolies when they were caught, 2 to 5 pounds. Now they’re 8 to 10 pounds. They’ll spawn every night. The females will cycle every other day. Then you’ll have eggs every day. That’s the ticket. A nice dolphin displays its finest colors on a day offshore. Stieglitz is a fisherman — making the most of his grant-funded research with that part of his mind — but his first purpose is to study the effects of the 2010 Deepwater Horizon Gulf of Mexico oil calamity on fish that inhabit the spill area, including dolphin/mahi. He tosses sardines into the tank, one at a time. The fish don’t pose and smile like those other dolphins, the mammals that are on the football helmet. These pick off the sardines without breaking stride. They look as if they’re in a hurry. Whether in a lab tank or the Gulf Stream, that is the dolphin’s life — speeding, feeding, using up and replenishing energy, always on the run, burning out too soon. In the tank they do everything they do in the ocean, except migrate. In the wild, a dolphin that isn’t caught and kept by one of us, or devoured by a wahoo or a blue marlin, is a robust senior citizen at age 3, a faltering geezer at 4-plus. The all-tackle world record, an 87-pounder caught off Costa Rica’s Pacific coast, almost certainly didn’t make it to 5. 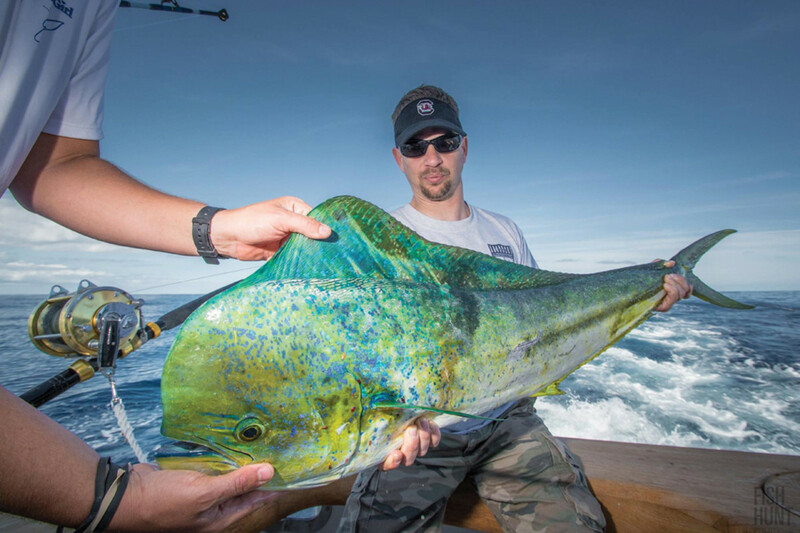 In Florida, most of us call them dolphin, although mahi is trending. 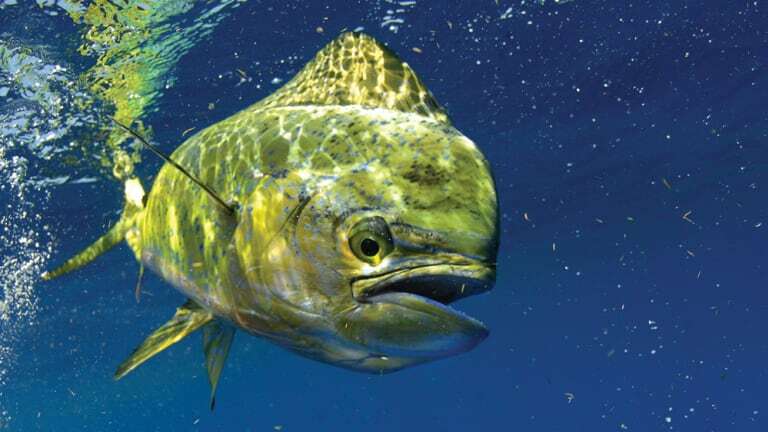 The International Game Fish Association, in an appeasing gesture to bottlenosers, refers to them as dolphinfish. That doesn’t look right, a “ph” and an “f” in the same word, but you’d better start there before getting into a fishing conversation in a non-English language. 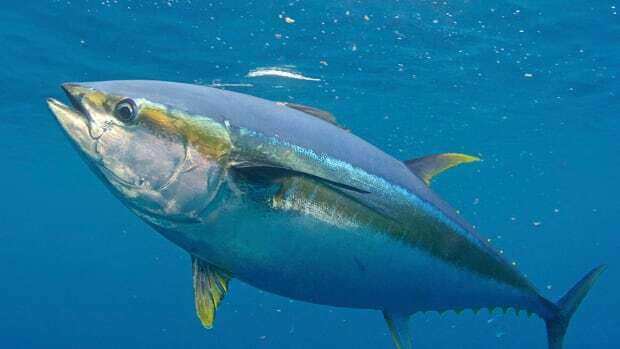 Run “dolphinfish” through Google’s translator, and you’ll get kynigón in Greek, shīra in Japanese. It’s doirado in the Galician dialect of Spain and dorád in Gaelic. When in Rome, say lampuga. In Paris, pardon my French, say coryphène. That mimics the scientific name, coryphaenidae. The Dutch, Danes and Germans call them gold mackerel. Dolphin live fast, love hard and die young,even when they don’t wind up in a fishbox. They have a life span of about 4 to 5 years. This document accuses eastern U.S. menu writers of calling dolphin mahi-mahi because it looks exotic, so they can charge the rubes a buck or two more. Don’t believe that about customers fearing dolphin are the offspring of Flipper, the bottlenose super-dolphin who performed heroic deeds on black-and-white television when the set had a circular screen like a washing machine. If you remember Flipper only on your good days, they can feed you horsemeat and you won’t know the difference. That Costa Rican all-tackle record 87-pounder was caught Sept. 26, 1976, by a gent named Manuel Salazar on 50-pound line. It was 5 feet, 9.5 inches long, with a girth of 28.7 inches. It bit on a trolled soft plastic squid. The second-biggest in IGFA ranks was caught near Cabo San Lucas, Mexico, on 80-pound line by James Dillon III on July 31, 2001. His lure was a Hawaiian Petrolero. On June 9, 2007, Florida fisherman Robert Vail caught an 81-pounder trolling a live goggle-eye under a kite near his home in Lantana. He thought he had a world record for 30-pound line, but his line tested closer to 50 and was disqualified. Florida doesn’t sweat line tests, so Vail set a state record that still swims. His fish was taken in water about 200 feet deep — unusually but not amazingly shallow for dolphin. 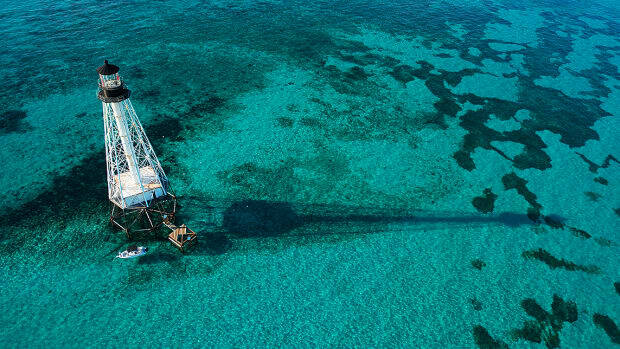 Stieglitz has seen them come to chum lines in 60 feet of green water over near-shore reefs. Miami charter captain Jimbo Thomas says make that 30 feet. Don’t look for them there. Usually dolphin chasers find them near the surface of blue water over bottom about 1,000 feet or deeper; 1,000 feet isn’t far offshore for southeast Florida, where foot-propulsion kayakers can reach the Gulf Stream. Come fishing with us now. 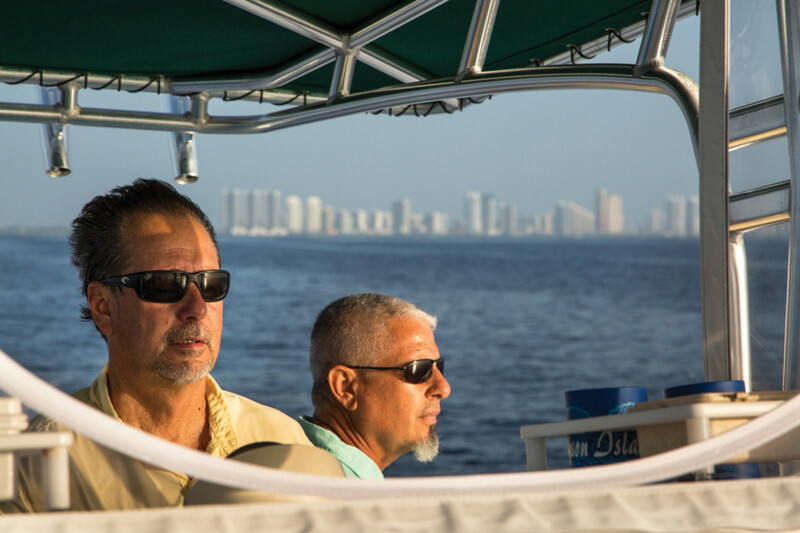 We’re aboard Bottom Line, a diesel-powered 34-foot Sea Vee owned by Miamian Mario Castillo. Our other partners are George Googas and Dean Waite. They all fish offshore more and know more about it than I do. Their catching skills are better, too, but as for the basics we are equals because, honestly, it’s almost entirely about finding those things. How to go do that is no insider’s secret. 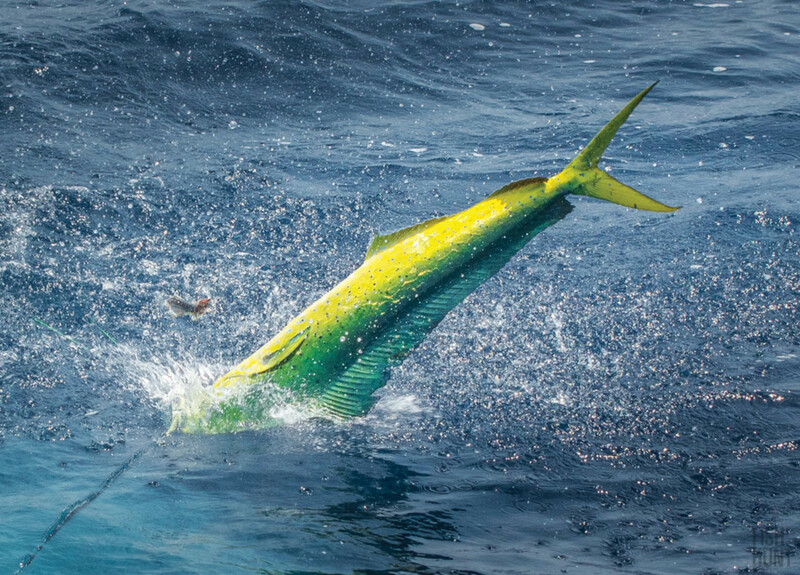 Running and gunning: Two South Florida anglers search for birds, weed lines and floating debris, all potential signs of the whereabouts of mahi-mahi. • Weed lines of sargassum: Wide and thick or patchy and sparse, it probably has lots of small forage taking shelter in and under. • Birds: Better a flock than a single but take what you can get. If they’re swooping, diving or both, investigate. • Floating debris: Nothing beats flotsam. A freight pallet is a dolphin magnet. In Hawaii, mahi hunters bundle bamboo into mats, drop them onto the water and stand by for action. In the Dominican Republic they do that with palm thatch. 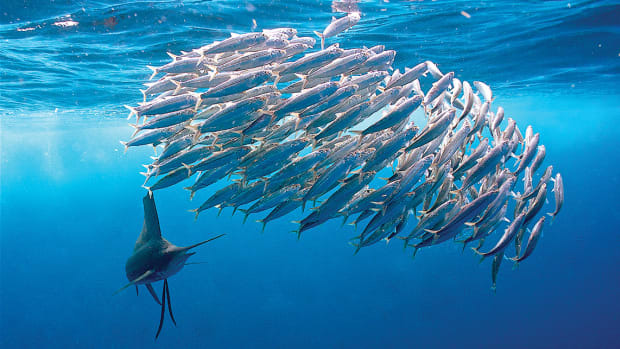 • Flying fish: National Geographic says their top swimming speed is 37 mph, not fast enough to escape dolphin. If they’re gliding above the surface, something’s probably after them. If they’re jumping and birds are diving on them, something’s caught them from below. Dolphin, we hope. On Bottom Line, we’re running and gunning, meaning that we’re moving along some quick, looking for any or all of the above. We find a lot of weed lines and troll their fringes without results. We see little stuff — almaco jacks and some blue runners. 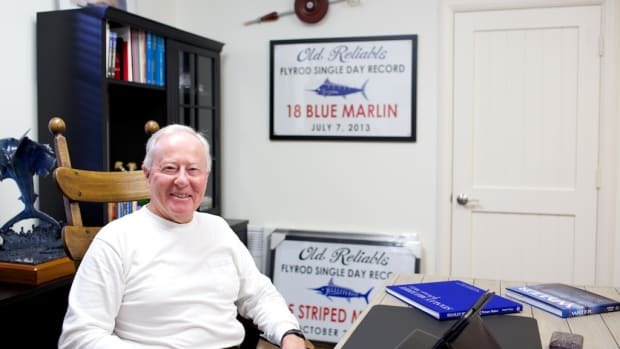 We chase flying fish, hooking nothing in their draft. We see no flotsam. 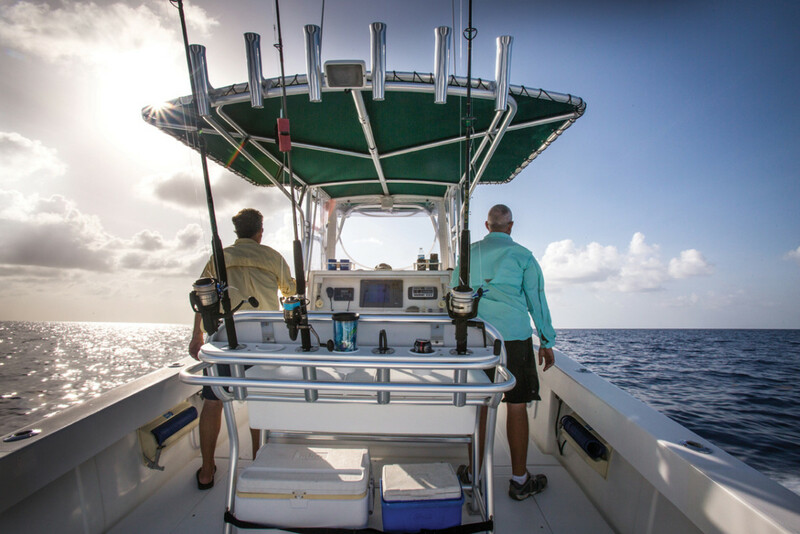 We cruise as far as 17 miles offshore, water as deep as 2,200 feet. Most birds we see — not a lot — are doing the same as we are with the same results. About 10 a.m. on 1,120 feet of water, we see a bird, probably a tern. It acts excited. George puts two flat lines trolling off the stern on ambitious 30-pound conventional rigs. On the port side near the end of our wake skips a chrome-headed blue and white-skirted lure meant to imitate a flying fish. “Something’s chasing the flyers,” Mario says, goosing the throttle a bit. The port-side rig replies, “zzzzzzzzzzz!” The fish doesn’t leap, as a dolphin should, likely because it’s overmatched by the tackle. It’s a cow dolphin, slightly longer than the 20-inch minimum. As George cranks it up, another rule-break joins the no-jump infraction: There’s no school of aranymakrélát (Hungarian) fluttering around. If there were, George would hold the cow in the water so the rest would stay, and we’d all cast lighter baits on spinning tackle. Alone, the fish swims toward the bow, where Mario grabs the leader and drops her into the fishbox. Flip, flap, flop she goes. That’s our only dolphin. We haven’t done a thing wrong, but we should’ve been there yesterday. “Those fish are traveling. They’re not hanging around. The last four or five days, they were killing ’em off Miami,” Mario says. On Sunday of that week, Dean and I, along with his neighbor Christophe Rouille and Chris’ dad, Jacques, fish on Dean’s boat, First Light. Hillsboro is the inlet near his home. Less than an hour from port, about eight miles offshore, Chris spots the first weed line and gets so excited that he splits his close-fitting shirt. We hurry our baits out — halves of cut balao hooked on 20-pound spinning gear — and hook up immediately. In the next hour and a half, we cover five miles east to west and find delfink (Slovenian) on every patch of sargassum. This is why we fish for these things: the spectacle of dolphin (Floridish) leaping, twisting, gleaming, splashing down and leaping again. It’s almost like watching Dancing with the Stars. You want to get up and try those moves yourself. Or Olympic figure skating, except that skaters are gigged for coming down headfirst. 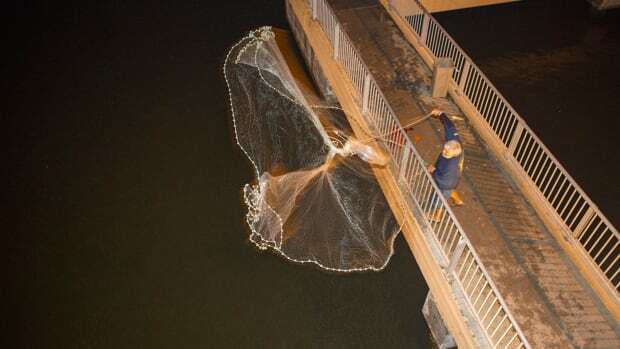 We’re too busy catching and coolering fish to count, much less weigh and measure them other than by eyeball. We bring aboard 18 korifena (Bulgarian), the smallest of them 2 or 3 inches over the minimum and the biggest (my guess) a 12-pound bull caught by Chris. If I’d caught it, I’d guess 15 pounds. Dean calls the lines in at 9:28 a.m., good timing. 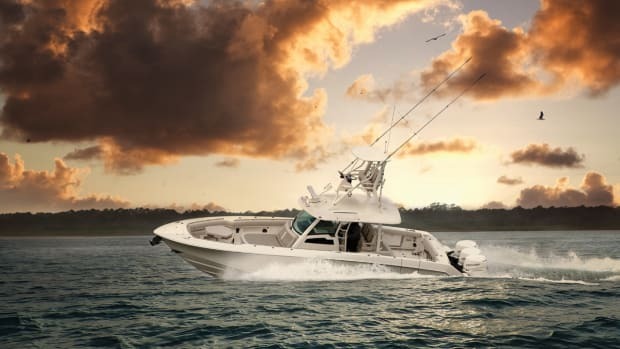 We feel as if we’ve been fishing all day. Back at Dean’s dock, it will take longer to fillet our skumbres (Lithuanian) than the hour and a half it took to catch them. When you’re chasing schoolies, the small ones are typically going north with the Gulf Stream, and the larger ones are going south. Maybe the smaller ones are trying to conserve energy by not swimming into the current. I use the compass in my binoculars to watch the birds while they’re trying to catch up to the fish so I can see when the fish turn. If they’re going south, we’re pretty certain they’re larger fish. When birds are sitting on the water, usually there are not going to be dolphin there. I think if they’ve got their little feet paddling around, the dolphin are going to bite them. When you find something floating, there’s bait underneath it. Even if there aren’t any dolphin, drop your sabiki rig down and catch those baits and put them in your well because that’s what they’re eating. They’ll eat anything, but if you match the hatch, it’s that much better. 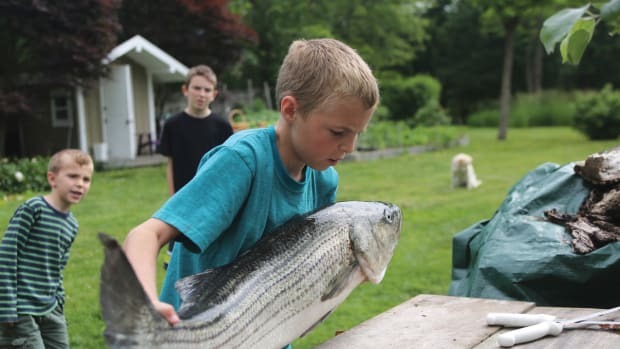 When they won’t bite, they’re still feeding — on little teeny minnows, little blue runners, little rainbow runners and others in the grass. And we’re throwing big pilchards and herring, but that’s not what they’re eating. Use your smallest baits. You can also cut little strips of bonito and jiggle them. 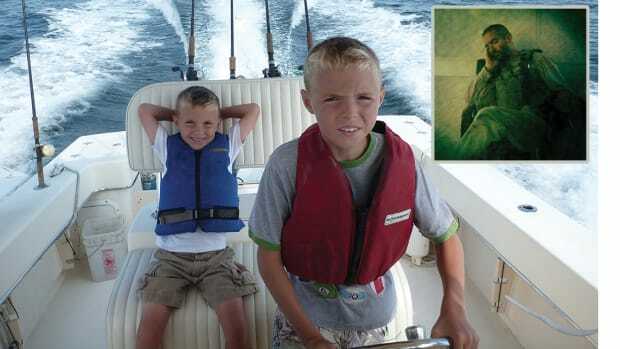 You can’t catch flying fish, but you can still use them for bait. Cut a dolphin’s belly open. Maybe they just ate a flying fish 10 minutes ago and it’s still in good shape. 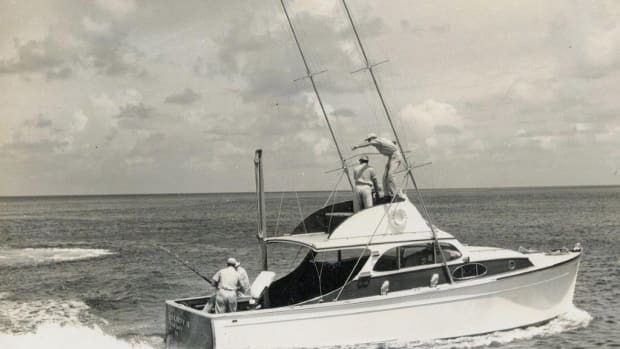 Long ago I caught a big dolphin that leapt and came down in my 17-foot center console and kept on jumping, knocking everything around. The wrasslin’ match that followed left me and the boat wearing as many scales as the fish. Most people don’t believe the story. Jimbo and Rick do.